President Trump, Canadian Prime Minister Justin Trudeau and Mexican President Enrique Peña Nieto signed the U.S.-Mexico-Canada Agreement on Friday. If approved by the legislative bodies of the three countries, USMCA will replace the 24-year-old North American Free Trade Agreement (NAFTA). What does it mean for the U.S. dairy industry? Final approval must be granted by the U.S. Congress and the legislative bodies in Mexico and Canada. With unpredictable political dynamics at play in all three countries, such approval is a big assumption. The timing of such approval is anyone's guess at this point. While the Trump administration wants quick approval, Congress could delay USMCA into 2020, an election year. If eventually approved, the ultimate impact of the USMCA agreement will depend on how it's implemented by the three countries. 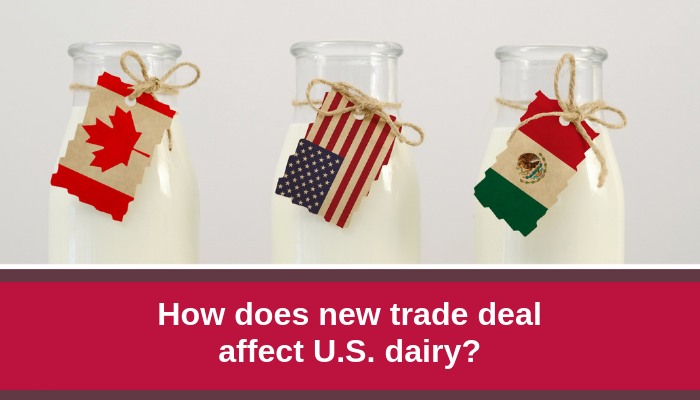 The U.S. dairy industry will engage with both parties in Congress to seek their support for the agreement's passage while at the same time seeking assurances that Canada will comply with their commitments in a fair and transparent manner.